Home >> Alternative fuels >> Electric car maintenance: How frequent maintenance can keep your wheels green? You are now the proud owner of a hybrid or an electric car. Congratulations! You are taking steps to use less oil and make the planet a little greener. When you decided to purchase a hybrid or electrical car, you probably weighed the pros and cons of a traditional car vs. a hybrid. Important elements of this comparison are gallons per mile and the car repair costs. Fortunately, hybrid cars can go much further on a gallon of gas than a traditional car, and the maintenance costs are much lower in the long term. Hybrid cars cost a little more to buy, but in the long term the low cost of the maintenance is well worth the extra months on your lease. Hybrid cars have two motor components: the electrical and the fuel-based. Since the fuel motor is used much less than in a traditional car, it lengthens the time between check ups and repairs. An electric motor requires the air filter to be changed every 40 000 miles or so, and the fuel motor will need an oil change ever 5 000 or 10 000 miles depending on usage and conditions. An interesting little fact is how breaks work in hybrid cars versus fuel cars. In fuel cars, brake pads have to be changed quite often because all the energy of the breaking goes into the pads. In the case of a hybrid, a lot of the energy used while breaking is captured by the pads and transferred to the battery to help recharge it. So not only can you charge your battery by plugging it, you also recharge it by driving! And since a lot of the energy is transferred to the battery and not the pads, the pads last much longer in a hybrid than in a fuel car. 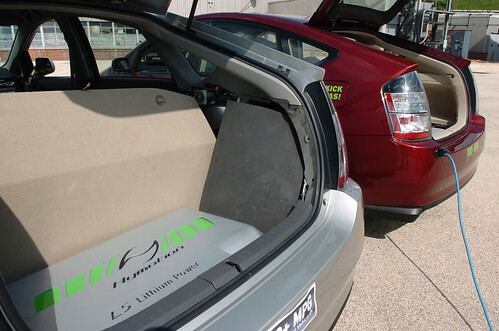 To avoid having to change the battery in your hybrid you need to maintain its charge between 40% and 60%. Keeping the charge within these boundaries will make the battery last much longer than if you charge it fully or if you let it get completely empty. Hybrid cars should ideally be brought back to the dealership for maintenance; if you move, go to a dealership of the same company. It might be a little more expensive, but since hybrid cars are so new, the dealership mechanics are the ones with the most experience dealing with their maintenance. You have made the right choice by buying a hybrid or electric car. You will help reduce gas dependence, you will save money on both gas and maintenance, and you will have a quiet, technologically-advanced car that will serve you well for years. If you have any questions about the daily maintenance of your new hybrid car, refer to your dealership. They will have the most up-to-date information and people trained to deal with the mechanics of your specific model. And of course, drive safely wherever you go.